A wood deck can really show its age over the years. Also, the maintenance to maintain your wood deck can be more than a little annoying. That is why more and more homeowners are seeing benefits of composite decks. Composite decks made from Trex materials can maintain the beauty of the deck for years to come with little to no maintenance. There are several advantages to a composite deck over a wood deck and we will cover a few. Wood decks need constant upkeep each season. From sanding to staining there is almost always maintenance that is needed. Where a composite deck would just need some soap and water to clean it up once a year. In addition to being durable and low maintenance, a composite deck made with Trex materials has a 25-year fade and stain warranty. Another benefit of a composite deck is the durability. Composite decking is designed to resist scratching, fading, staining and mold. Also, a composite deck is insect proof. Another factor is the aesthetics of a composite deck. With a multitude of color choices, and a natural look homeowners can really choose the exact look they are going for. Environmentally friendly is another aspect of these decks. The deck boards themselves are made from recycled materials. Finally, the value is another added benefit. Initially, a composite deck may be higher but in the long run with way less maintenance and a longer durability, you will save money. If you in search of an experienced composite deck builder then look no further than Miles Bradley. 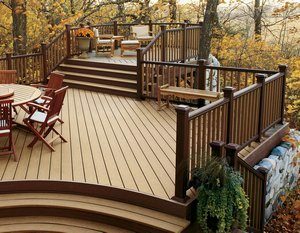 We have built hundreds of composite decks throughout the years all over Michigan and Illinois. You can visit our portfolio of decks here. Give us a call today in the Detroit area at 248-478-8660 or for the Chicago area at 847-920-7601 and see what Miles Bradley can do for you! Here at Miles Bradley, we strive to provide the best and highest quality service to our clients. We have been committed to giving our clients competitive pricing and the highest quality experience in the industry. For over 25 years we have proven time and time again that we are the best deck builder in Michigan and Illinois, and we have the awards to prove it. It started back in 1991 when our owner Paige Bradley Wedgle wanted to create a custom deck designing and building company. Over 25 years and countless awards later Miles Bradley has two locations and many happy clients. We made sure that from concept to completion that your deck is perfect. You can see our portfolio or work that we’ve done over the years, from decks to gazeebos, and three seasons room, we’ve done it all. Whether it’s a multi-level deck, wrap around deck, or a hot tub addition, we can build it. There are several examples of how we were able to custom fit and design each deck to suit our client’s needs. Our expert team of designers will create a mock-up and give you the deck of your dreams. If you want a deck that is low maintenance, easy to clean, and will stand the test of time composite decking is for you.We wanted to provide a lasting solution to deck longevity, which is why we became Trex platinum certified. Trex decking not only has longevity and is easy to clean but its also made from recycled materials and is eco-friendly. Check out more information about Trex decking here. If you have a deck, but it’s missing a certain.. something we recommend adding a Pergola, Trellis, or privacy wall for added comfort. Not only will you create an ambiance and increase your home’s value in the process! IF you want to be able to enjoy the Michigan summer on your new deck, book your deck installation soon! Our books are wide open during this time of year, so get your date booked today!